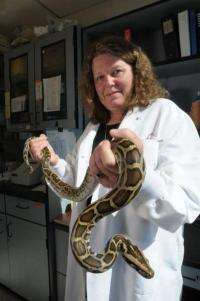 CU-Boulder Professor Leslie Leinwand and her research team found the amount of triglycerides -- the main constituent of natural fats and oils -- in the blood of Burmese pythons one day after eating increased by more than fifty-fold. Despite the massive amount of fatty acids in the python bloodstream there was no evidence of fat deposition in the heart, and the researchers also saw an increase in the activity of a key enzyme known to protect the heart from damage. Previous studies have shown that the hearts of Burmese pythons can grow in mass by 40 percent within 24 to 72 hours after a large meal, and that metabolism immediately after swallowing prey can shoot up by forty-fold. As big around as telephone poles, adult Burmese pythons can swallow prey as large as deer, have been known to reach a length of 27 feet and are able to fast for up to a year with few ill effects. The prey of Burmese pythons can be up to 100 percent of the constricting snake's body mass, said Leinwand, who holds a Marsico Endowed Chair of Excellence at CU-Boulder. "When a python eats, something extraordinary happens. Its metabolism increases by more than forty-fold and the size of its organs increase significantly in mass by building new tissue, which is broken back down during the digestion process."